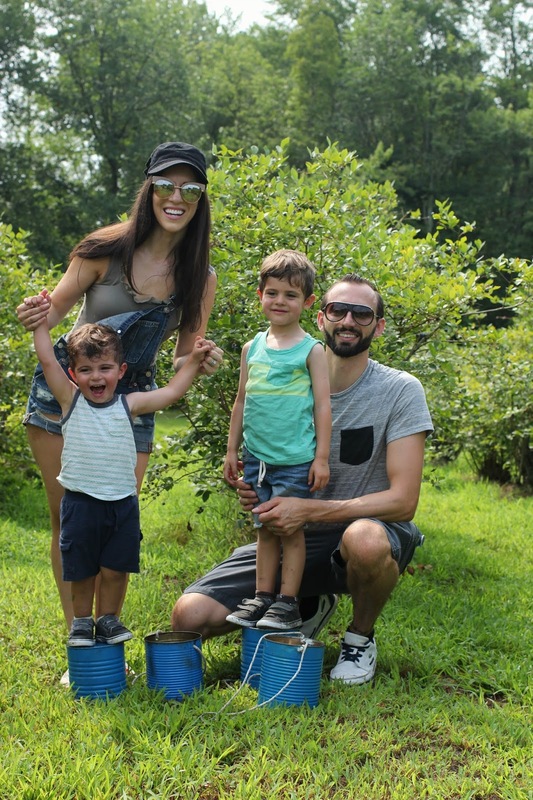 I'm so glad we were able to continue our tradition of blueberry picking but of course this weekend happened to be one of the hottest ones we've had. I know July is known for those crazy warm temps and humidity that you feel like you can cut through, but holy hot! 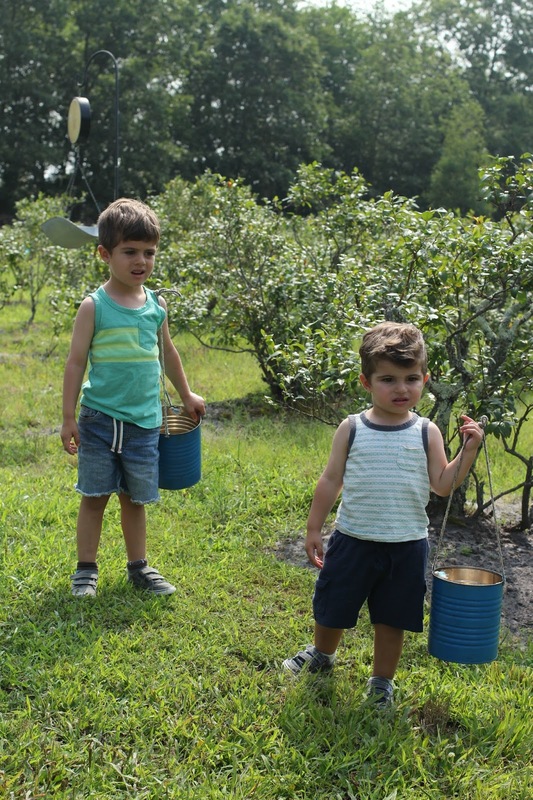 I've been going blueberry picking ever since I can remember and if you visit this little space often then you know it's been a fun tradition we've continued with the boys. Look at how small little nugget was last year. He wasn't even walking yet and this year he was mister independent. Within two minutes, no more like 30 seconds, we were all dripping sweat. You can see the boys hot stink faces in their bucket picture where I can envision them thinking you want me to go around and pick things off of these bushes in this heat? Since it's pretty late in the season we weren't even sure if there were going to be many blueberries left, but they assured us there were plenty out there we just really had to look in the bushes. There were a lot left but they were smaller in size than what we normally find. That size didn't matter though because they were just as sweet and juicy and the boys probably ate more than they put in their buckets. The boys saw some chickens off in the distance that ended up making their way to the fields and randomly trotted up and down the rows. The boys thought they would be able to catch one and little nugget even took off after one with his bucket. No chickens were caught during this picking and everyone carried on. Keeping the temperatures in mind we did keep this short and to the point, of course part of the point being to take a family picture. 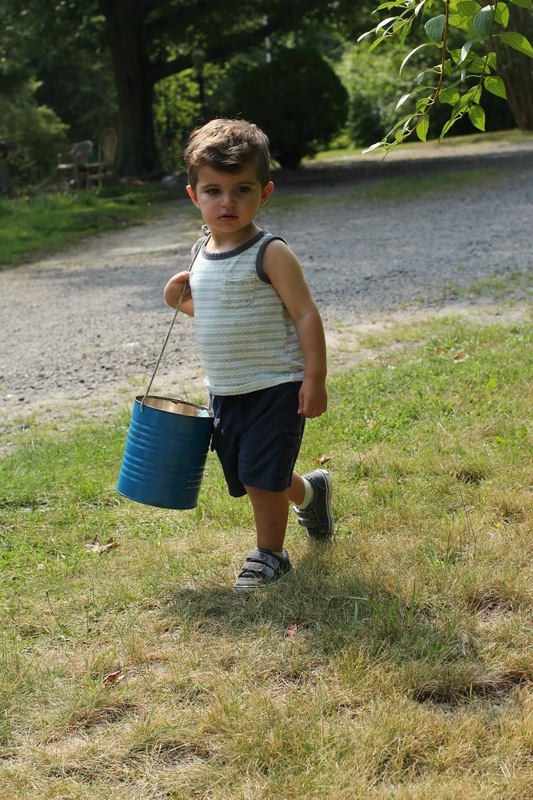 Once we saw little nugget hang his bucket up on a bush and hit it back in forth instead of picking the berries, we knew it was time to go. Thankfully my Dad has a nice in-ground pool so the first thing we did when we got back was jumped right in.